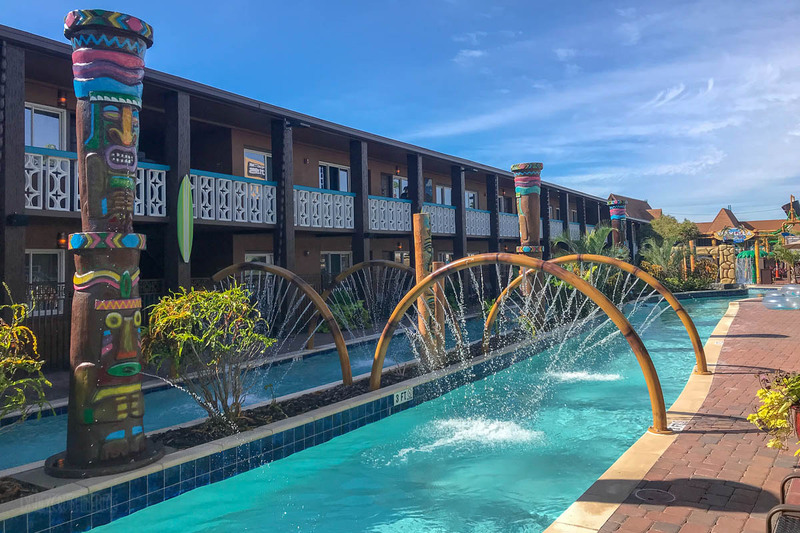 The Westgate Cocoa Beach Resort recently underwent a $15 million comprehensive renovation which includes full upgrades to every aspect of the property, including its 120 two-bedroom suites, hotel lobby, courtyard and pool. 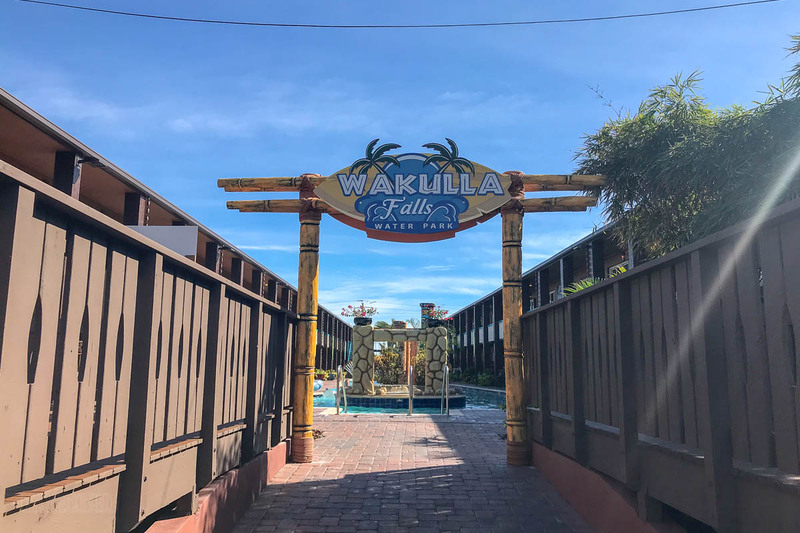 The property was formerly known as Wakulla Suites. 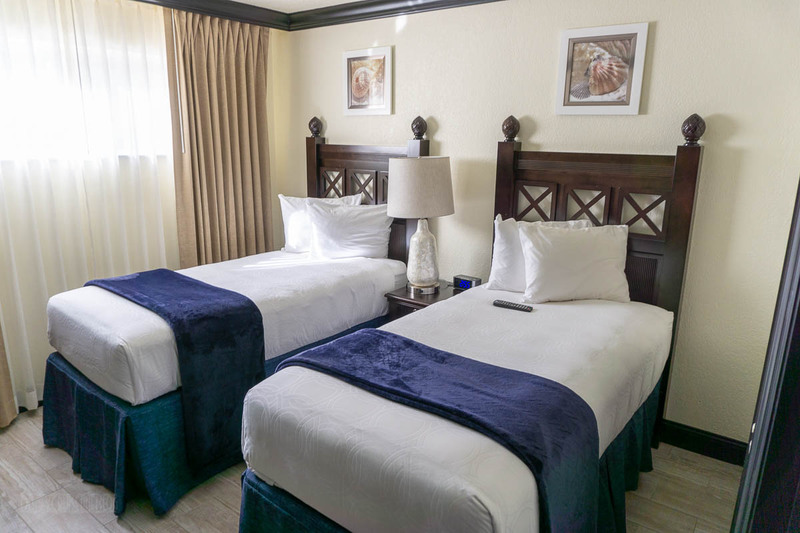 In June 2018, the Polynesian-themed oceanfront resort opened featuring two-bedroom suites. 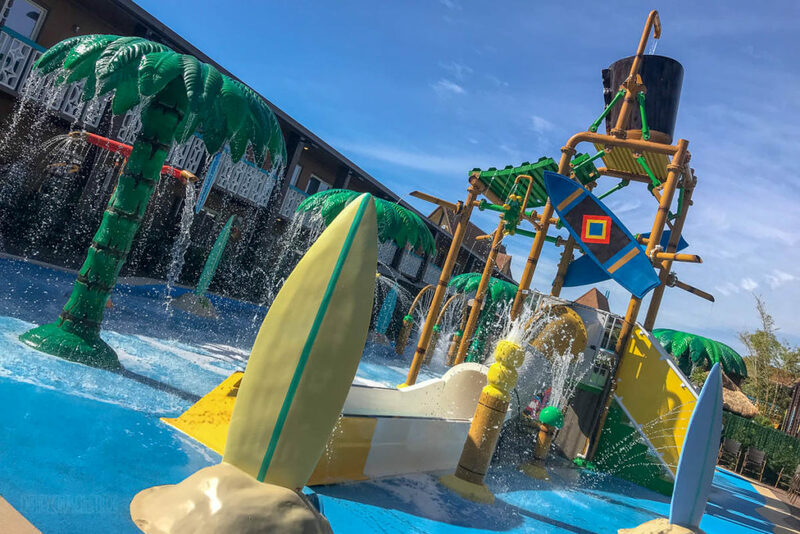 In this hotel review, we’ll give you a tour of the resort and let you know whether or not we think this is place to consider for a pre-/post-cruise stay with your family. 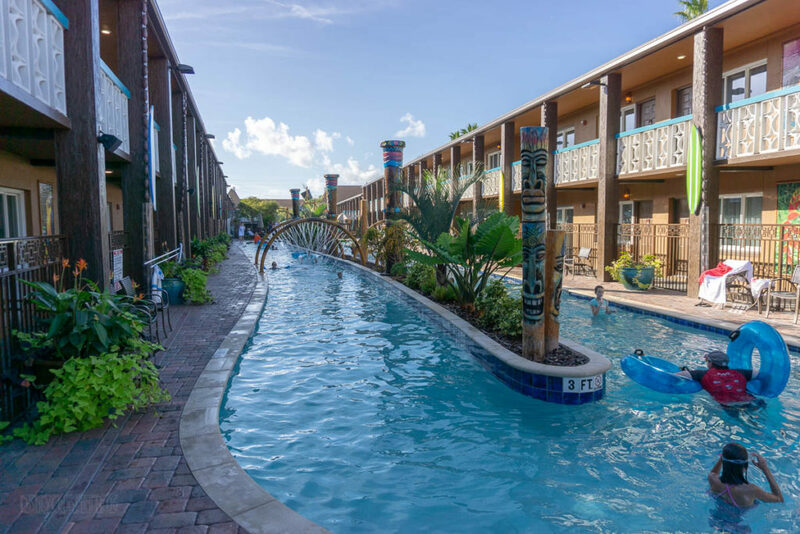 Westgate Cocoa Beach Resort is a short 20-minutes drive south of Disney Cruise Line’s terminal at Port Canaveral on North Atlantic Avenue and just about a mile away from the Cocoa Beach Pier. 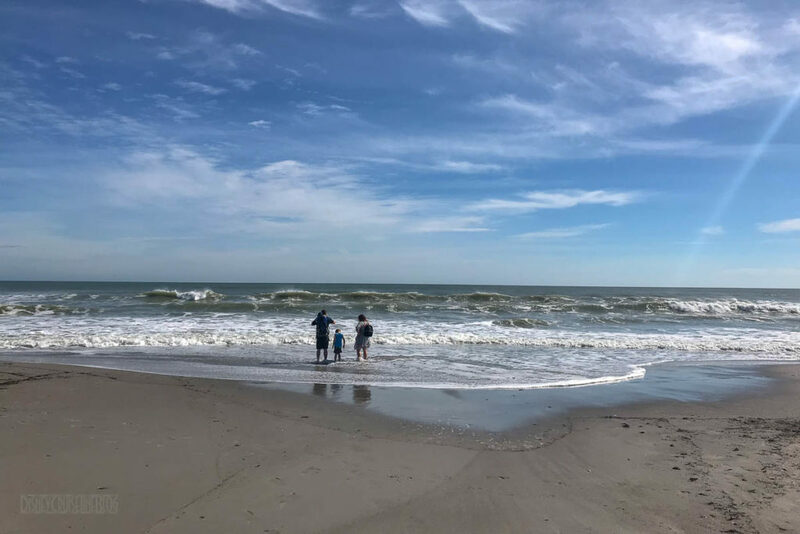 A little background since this was not a pre-/post-cruise stay….. Emily signed up to run the Space Coast Half Marathon which was held on the Sunday following Thanksgiving and my parents were also visiting. So, we thought it would be a great idea to spend a few days after Thanksgiving at the beach, and eliminate the need for Emily to drive to the race the morning of. Emily booked a beach resort for all of us and then I caught wind of the renovation from a press release that landed in my inbox. 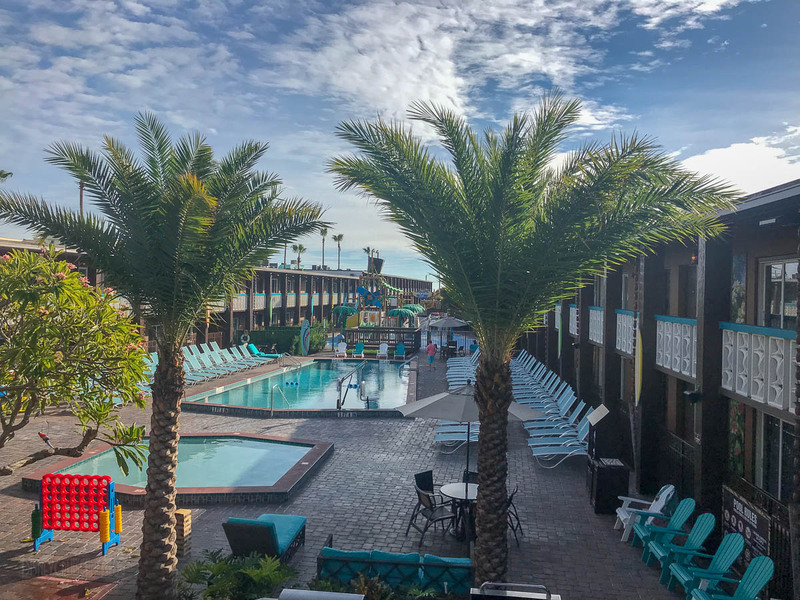 After comparing the location, rates, and amenities, we opted to drop our original reservation and book a few nights at the Westgate Cocoa Beach Resort. By the way, the Space Coast Marathon & Half Marathon event is really great. The post race breakfast is amazing and even spectators are welcome for only $5! All of the guest rooms at the resort are two-bedroom villas which can accommodate up to six guests. The bedrooms were at the rear of the unit with a master bedroom featuring a king size bed and a full bath on one side and second bedroom of nearly equal size on the other with twin beds. 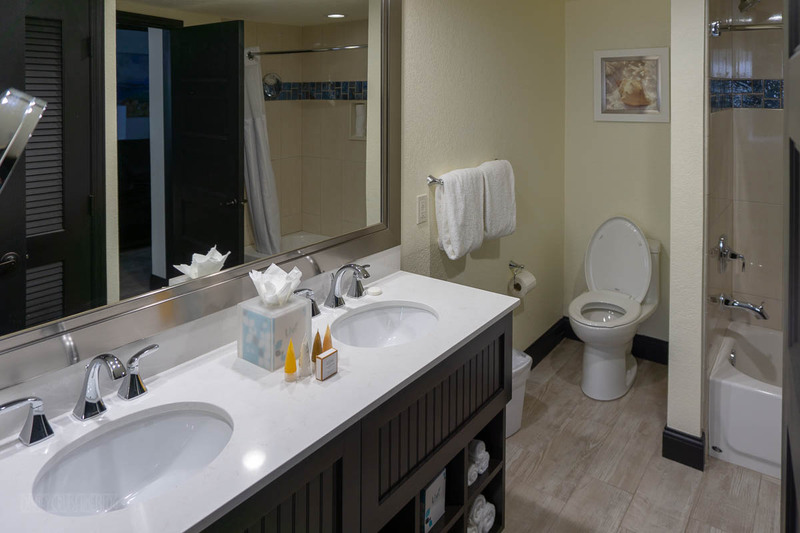 The master bedroom differs from the 2nd bedroom as it has an on-suite master bath as well as a separate vanity with a sink in the bedroom. 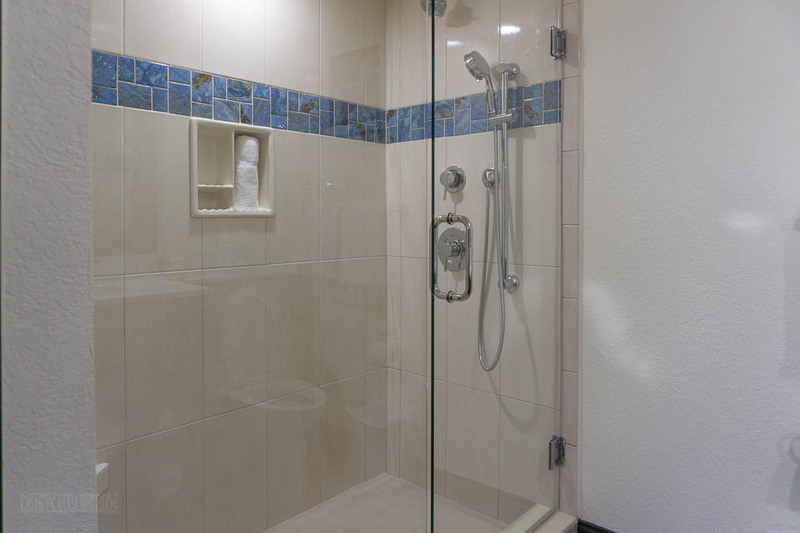 The master bath features a walk-in shower. 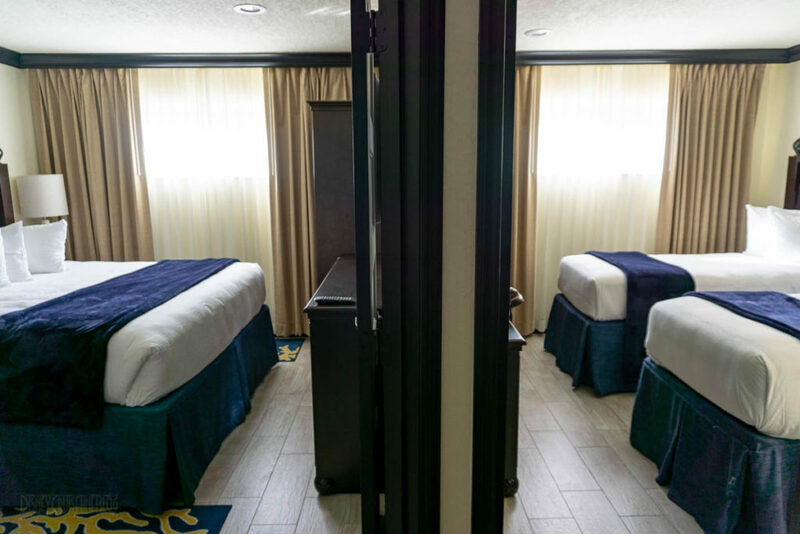 The second bedroom is complete with twin beds and a shared night table with lamp and alarm clock. 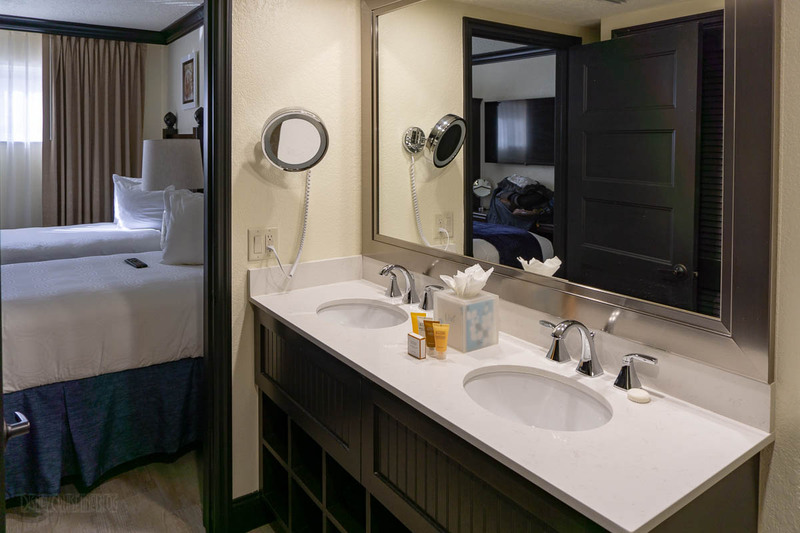 Technically, the second full bath connects to the 2nd bedroom, but there is also a door in the hallway as this is the defacto shared bathroom for anyone sleeping on the pull-out couch. 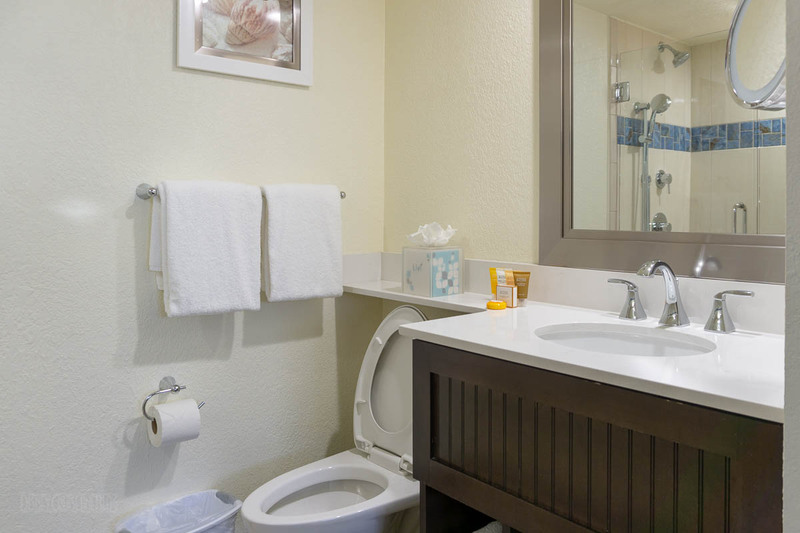 Unlike the master, the shared full bath’s shower where you will find the suite’s bathtub. 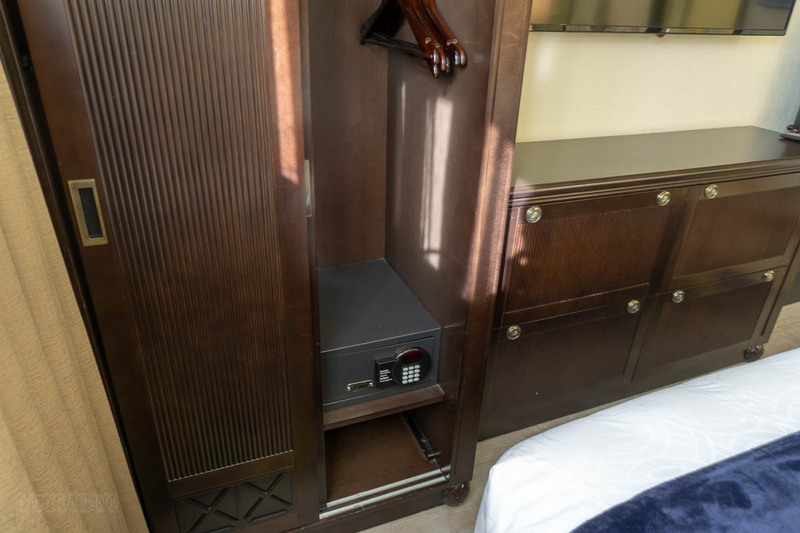 Both bedrooms have the same wall mounted HDTV, dresser, and closet with coded safes. 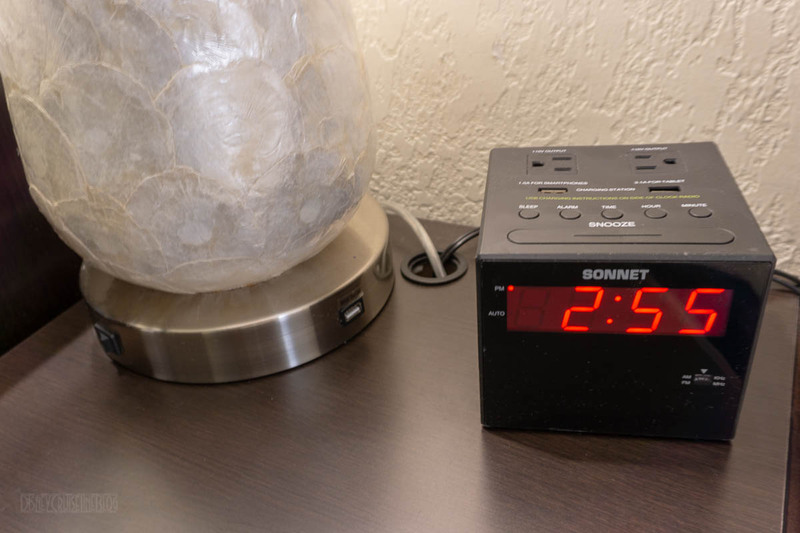 The lamps throughout the unit feature USB charging ports in the base and the alarm clocks in the bedroom include USB charging ports and traditional power outlets. For what it’s worth, the USB outlets were hit and miss as the majority of the USB outlets did not work, but this does not surprise me – I find way more damaged USB outlets in my travels than I do usable outlets. 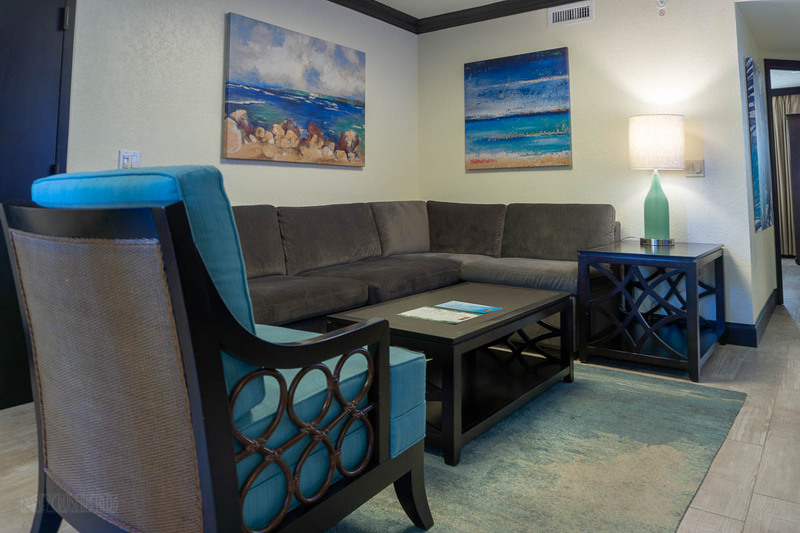 The living area of the suite features a sectional couch with a queen pull out bed, a coffee table, chair, and end table with another lamp with a working USB charger in the base. 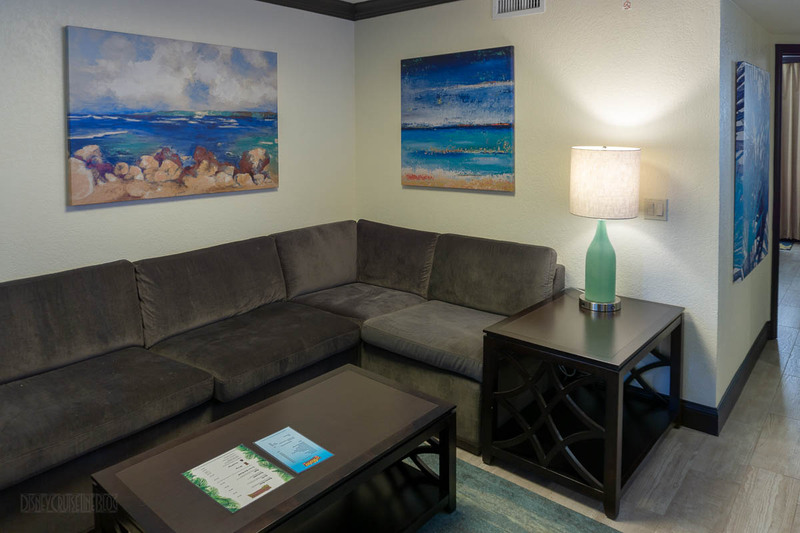 There is a connecting room door in this space which would allow groups up to 12 between the two suites or less if you just want spread across 4 bedrooms. This was Isabelle’s sleeping quarters during our stay and she was perfectly comfortable sleeping on the couch instead of the pullout. I will say, the couch was comfortable. 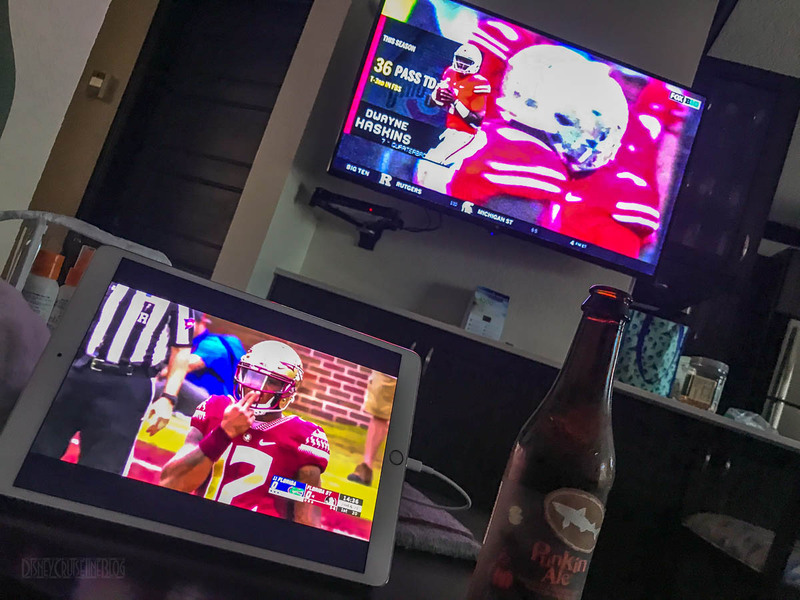 I spent the majority of a day on the couch watching football on rivalry weekend with my dad while the rest of the family enjoyed time between the beach and pool. 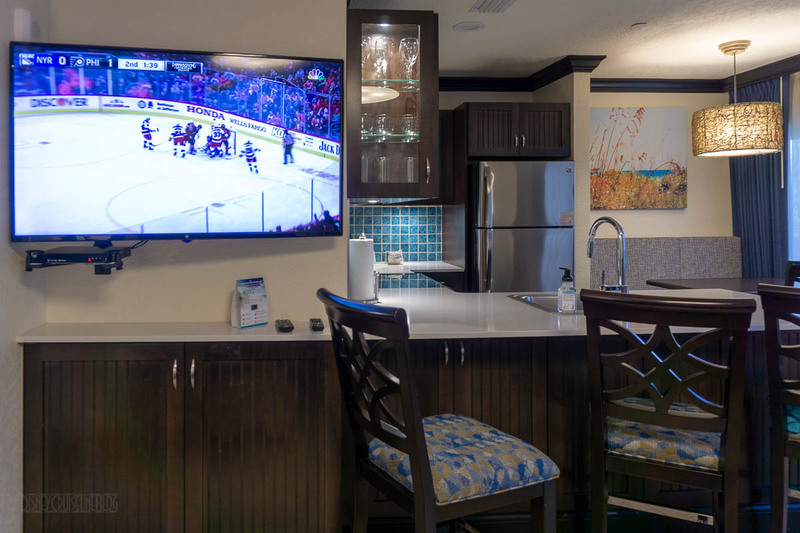 The couch faces a wall mounted HDTV with a DVD player as well as the kitchen area. 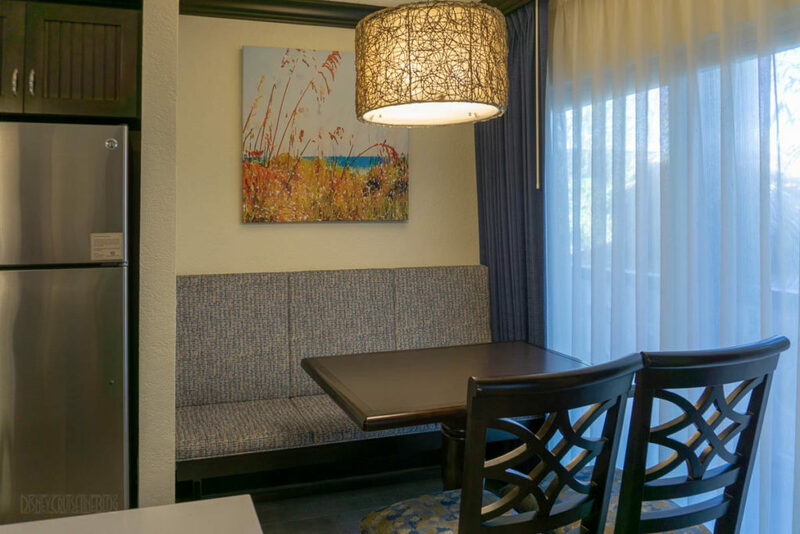 There is ample seating in the suite with three chairs up against the breakfast bar and the kitchen table. The kitchen offered just about everything one would need to prepare a family dinner. We joked, but we could have cooked our entire Thanksgiving dinner in this kitchen. We settled for reheating the Thanksgiving leftovers we brought with us. 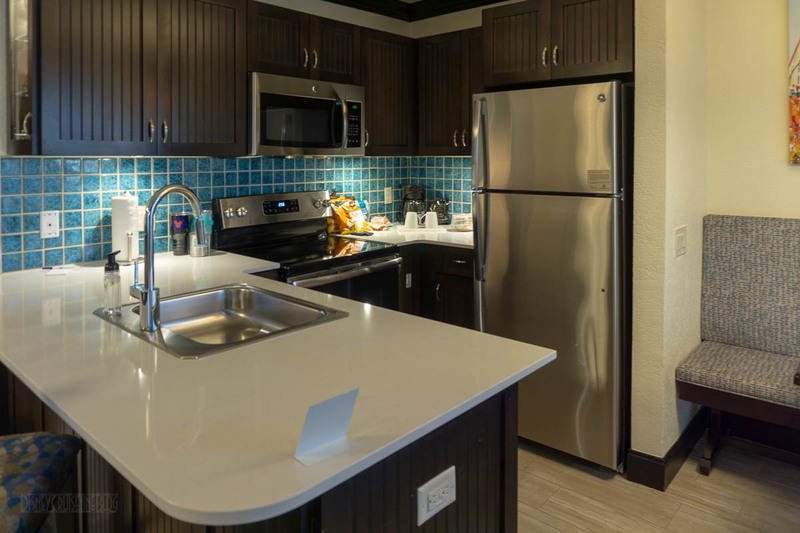 The kitchen is complete with a refrigerator, full size oven, microwave, and dishwasher. The only thing missing was a hand mixer and garbage disposal. 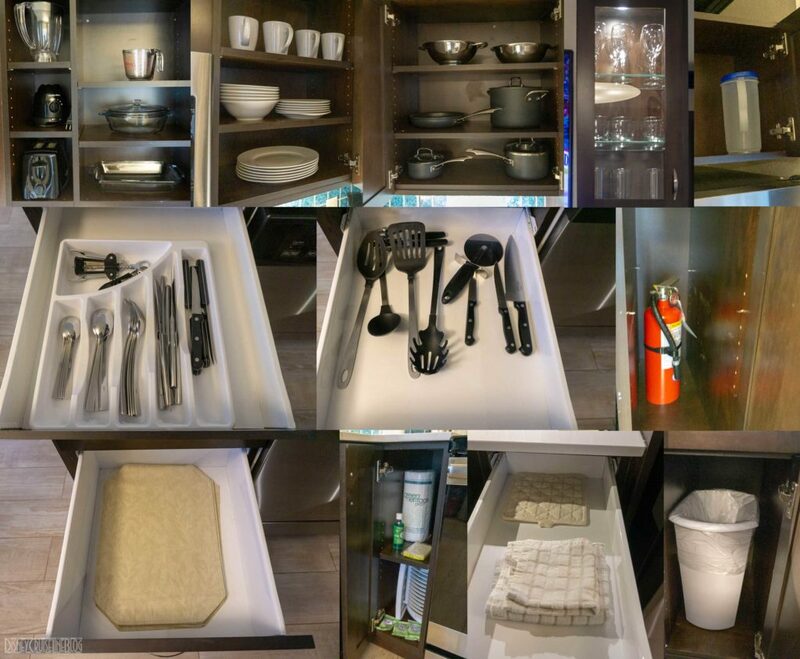 The following picture provides a closer look at the accessories, small appliances, and miscellaneous items provided in the kitchen. 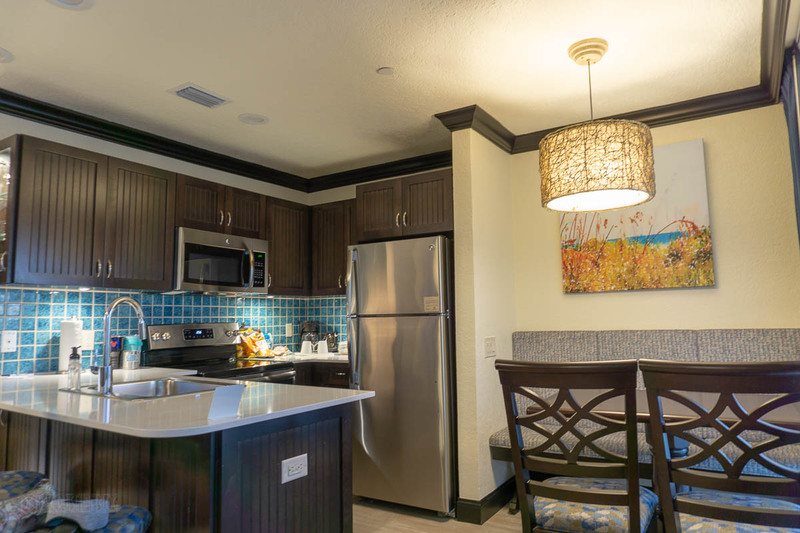 The kitchen is stocked with the basic small appliances such as a coffee maker, toaster, and blender. Pots, pans, colander, bowls, silverware, serving utensil, bottle opener, corkscrew are some of the miscellaneous items available if you choose to stay in to cook or get take out from any one fo the many area restaurants. 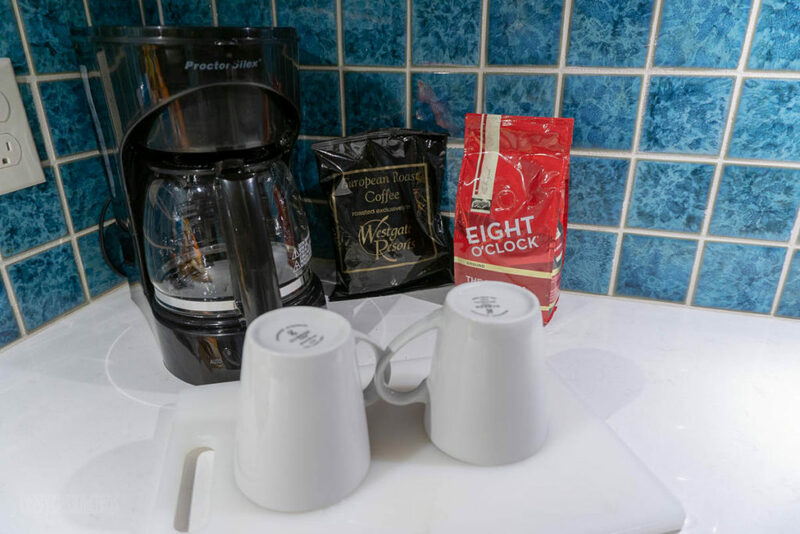 The kitchen did include some complimentary coffee, but I’d suggest brining your own coffee grounds is you are regular coffee drinkers. There is a kitchen table with bench seating and two additional chairs. 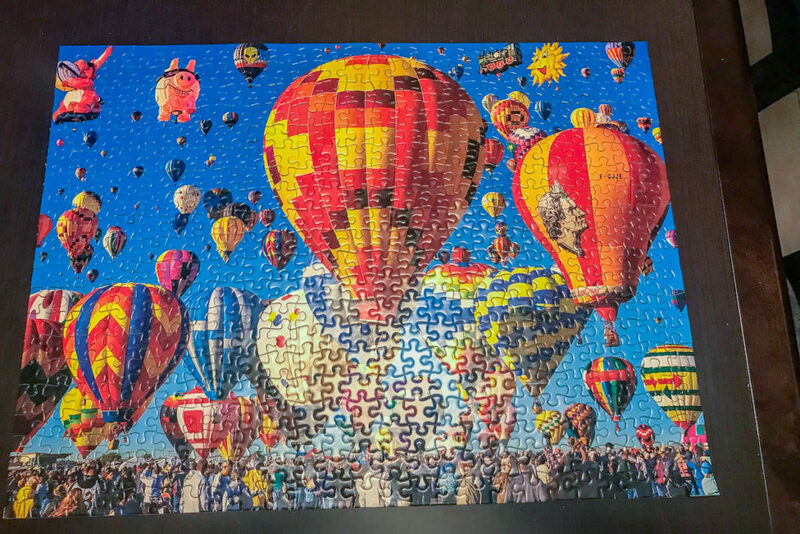 The table along the sliding doors was a great spot for the family to put together a puzzle. 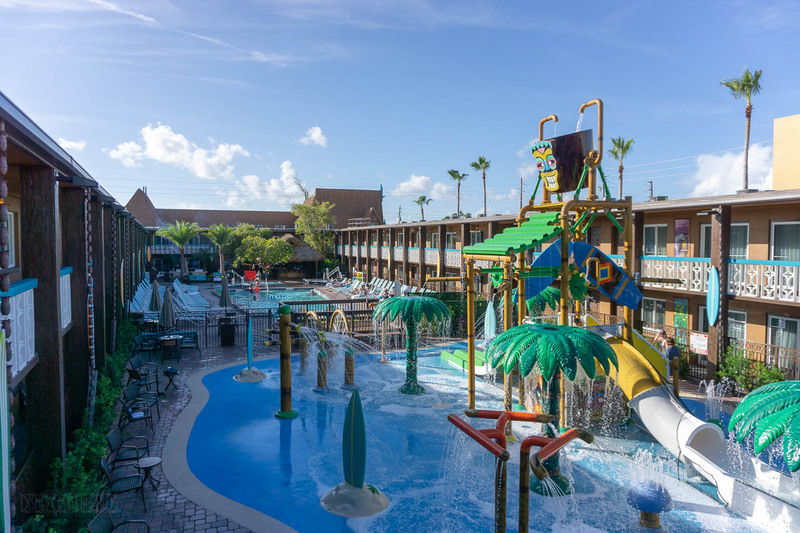 The primary reasons to stay at Cocoa Beach Resort is the location to the beach and the pool area, which is highlighted by a tropical themed water park complete with a lazy river. 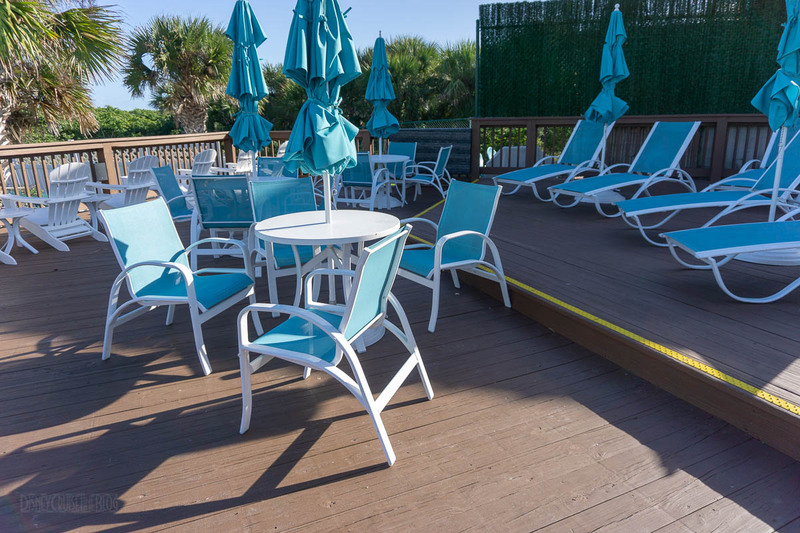 The pool is surrounded by an abundance of loungers and chairs. Granted, our stay was in late-November, but we did had excellent weather and there were always loungers available. Tucked in the corner of the pool area is the Aloha Tiki Bar & Cafe which also served food. 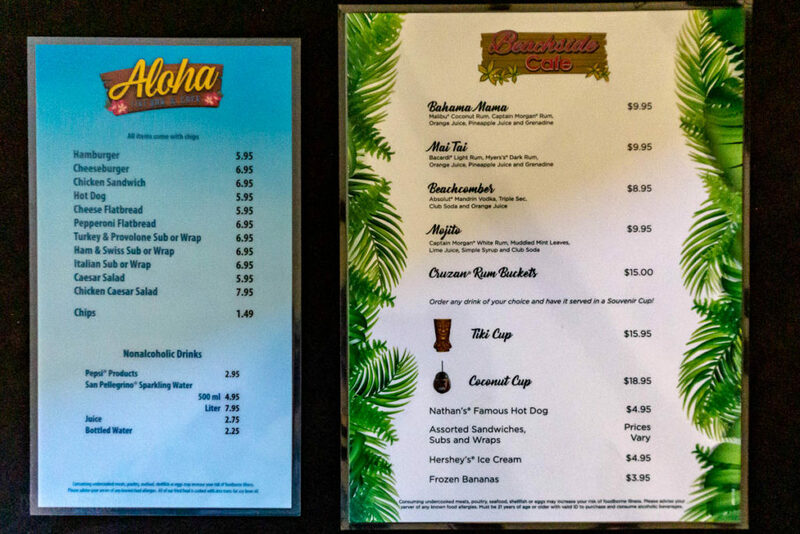 The second menu below is for the Beachside Cafe which is located just off the beach. We did not order from either of the venues, but I did appreciate the fact the Beachside Cafe offered some grab and go sandwiches and wraps. However, there is a Winn-Dixie just a couple blocks down the street. The grocery store is across the street from Ron John Surf Shop, which took us about 10 minutes to get to on foot. 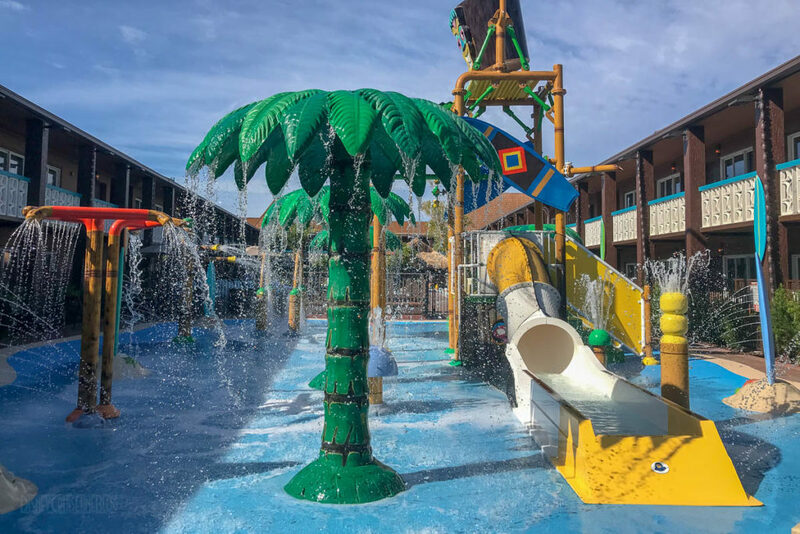 The showpiece of the resort is the Wakulla Falls Water Park is composed of a pool, lazy river and splash pad. 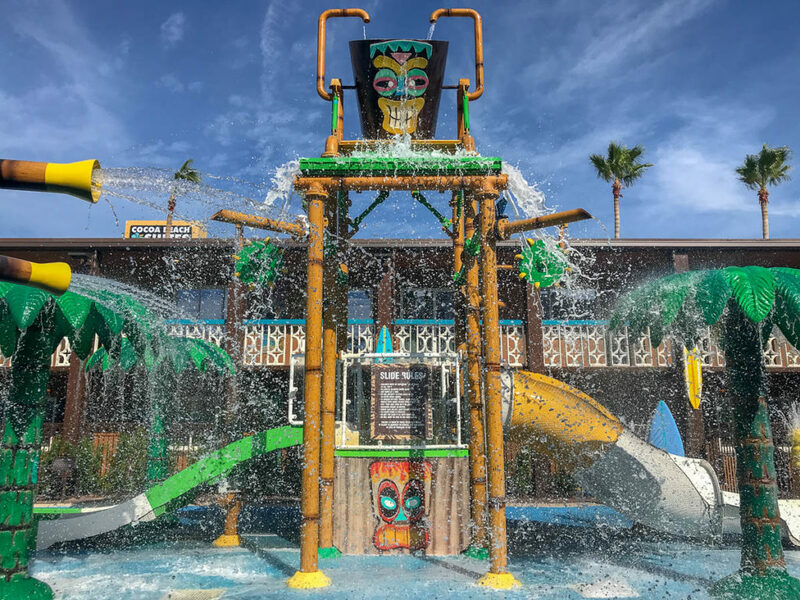 The splash pad features a two-story waterslide, water features and smaller waterslides. The lazy river is a 335-foot loop down the center of the property. At the far end of the central courtyard you will find the Makua Lanai adult area; think of this as the resorts version of the Quiet Cove. Last, but certainly not least, is the beach access because what is a beach resort without a beach. 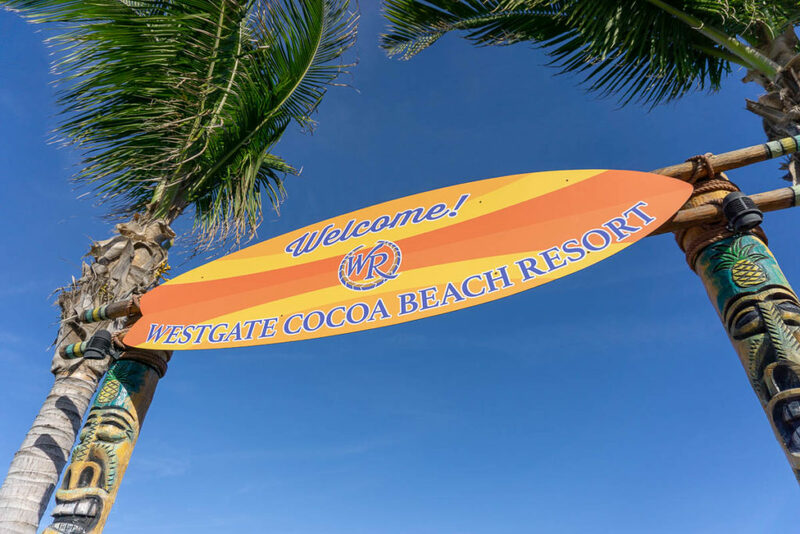 Westgate Cocoa Beach Resort includes access to the beach. 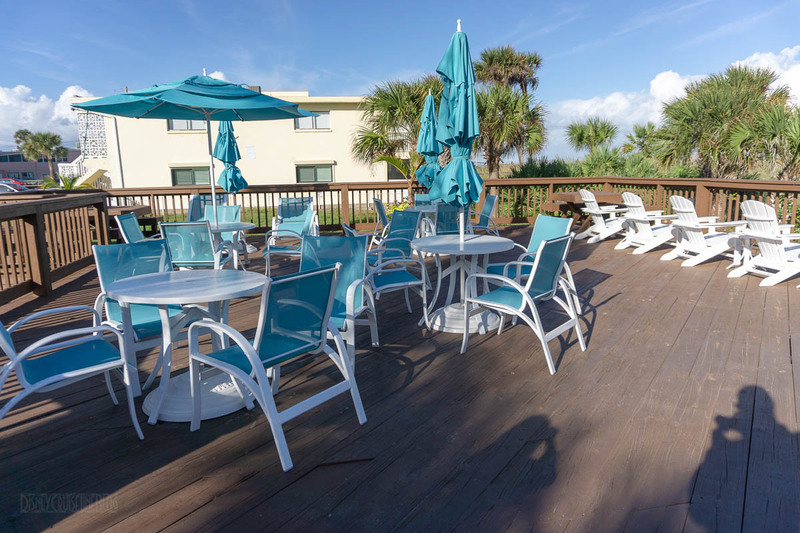 At the entry point, you will find the previously mentioned Beachside Cafe which also doubles as the fitness center. 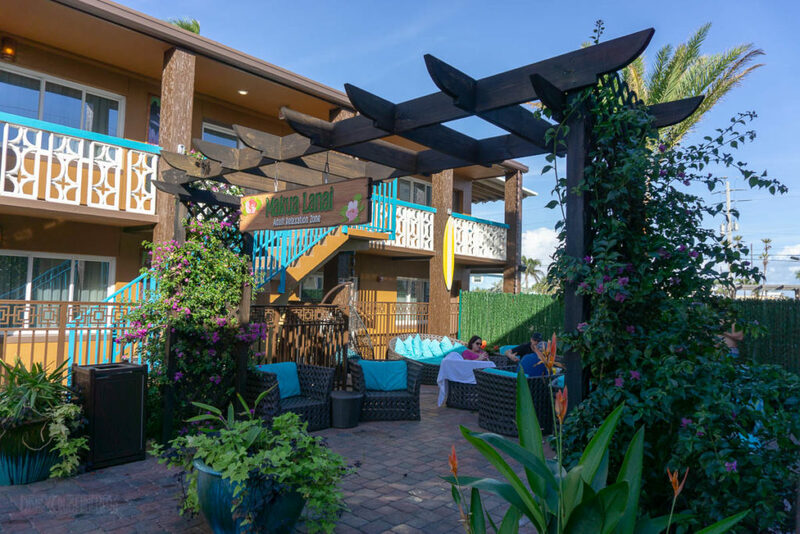 Just past the cafe, the resort has a patio with additional tables and lounge chairs for those that want to be close to the beach, but not on the beach. 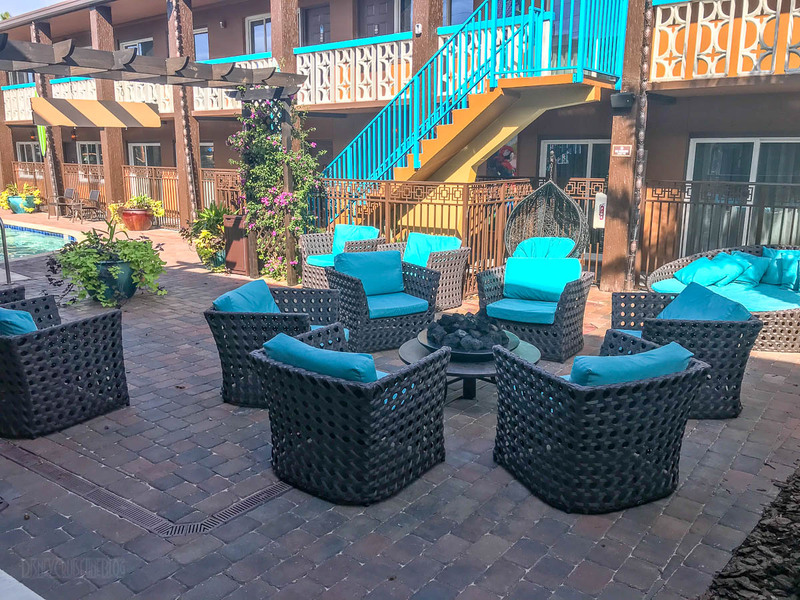 I’m sure if I was up and out, the patio would provide a great location for a morning cup of coffee while watching the sunrise. The walkway to the beach is fantastic. 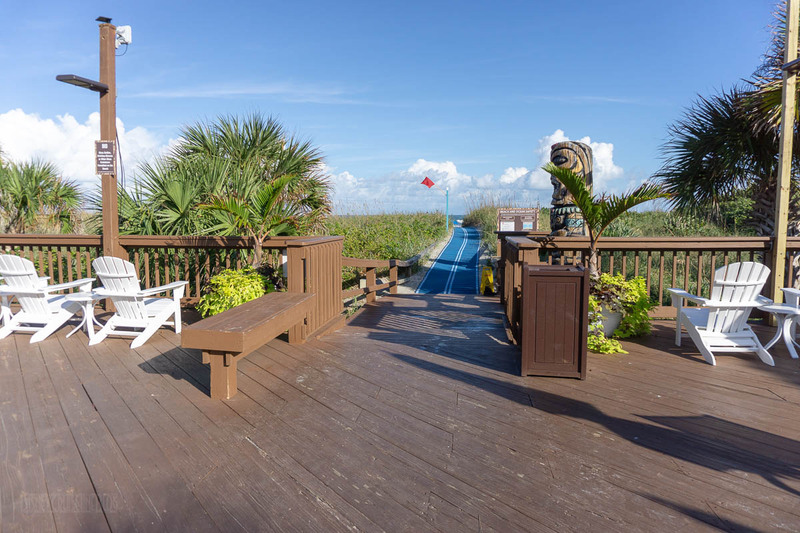 No seriously, the walkway is not a boardwalk, it is not sand; it is a mesh runner on top of the sand. 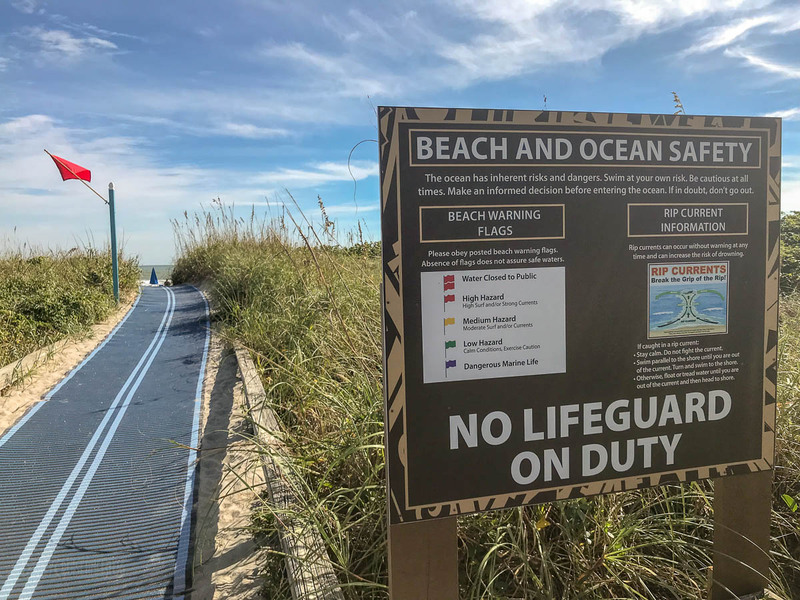 I really wish Jetty Park would install a walkway like this as it would make the walk from the parking area to the beach so much easier. The beach is set up with beach toys, a volleyball court and even corn hole. 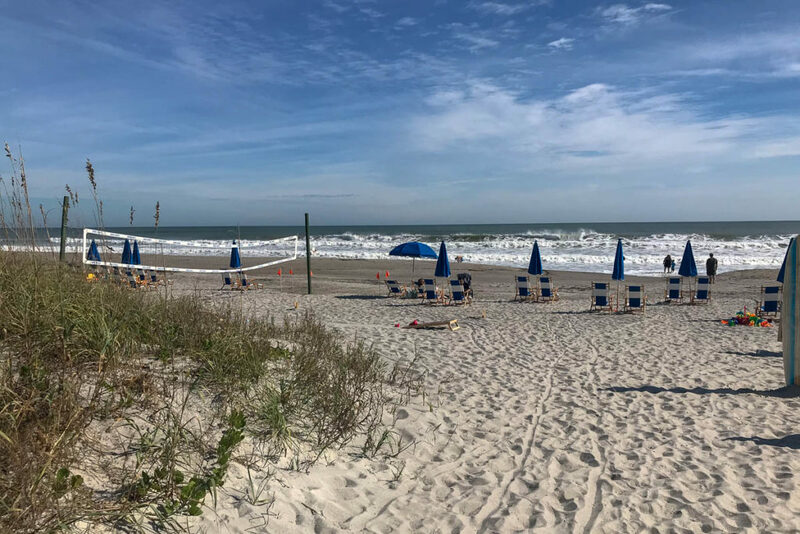 There is one important aspect to note about the beach at this resort. The chairs and umbrellas are an extra charge. At the time of our visit, two chairs and an umbrella ran $10 for an hour, or $25 for the full day. We brought our own beach chairs and umbrella and used them without any issue. This is a view looking back at the walkway. 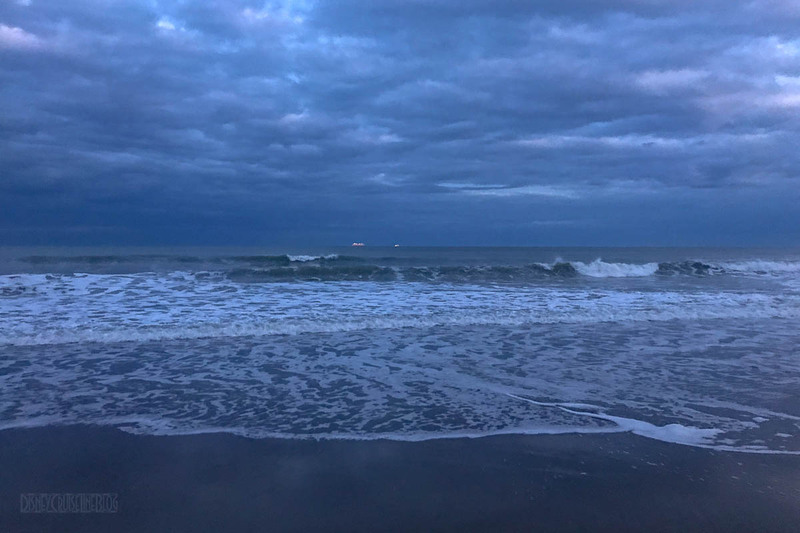 While I’d normally suggest driving over to Port Canaveral to watch the cruise ships depart, you can alway watch them from the beach. However, if you prefer to stay at the resort, this is what the Disney Fantasy looks like on a late-November Saturday night. 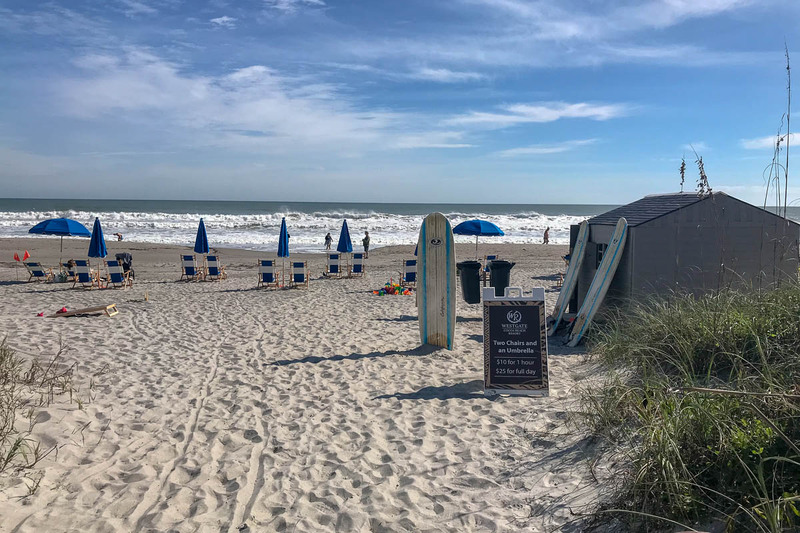 Another perk of staying at this resort is that they offer complimentary shuttle service to Cocoa Beach Pier which is also a Westgate property. 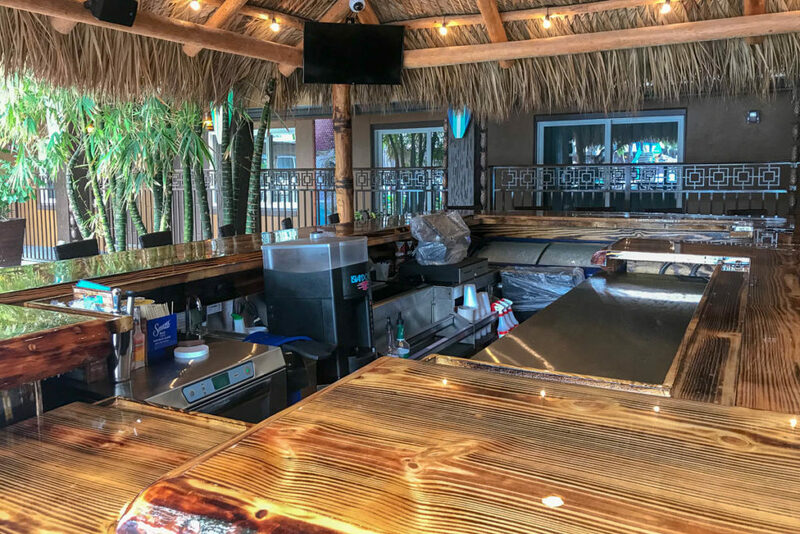 The pier offers five restaurants and bars, three retail stores, surf lessons, beach equipment and bicycle rentals, as well as beachside cabana service. During our stay, the shuttle was in operation from 9 AM to 10:30 PM. The shuttle departs from the resort at the top of every hour and departs the pier at the bottom of every hour. The Cocoa Beach Resort stretches from North Atlantic Avenue past Ocean Beach Boulevard to the beach. 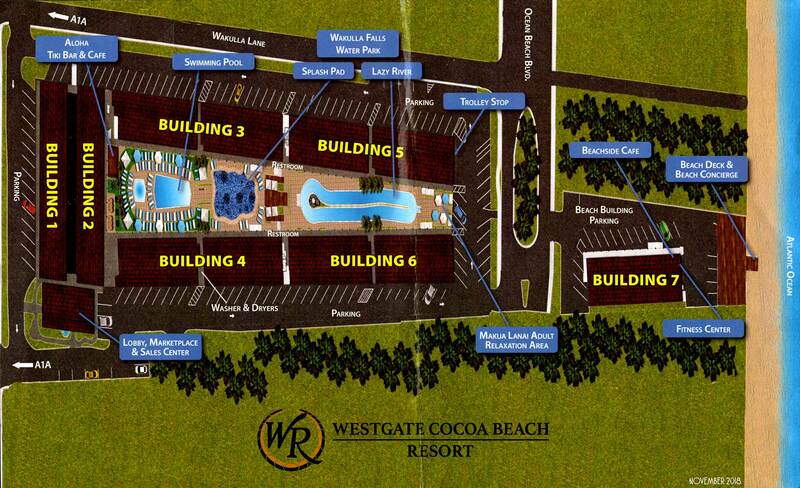 The resort map below offers a better idea on how the property is laid out. Our room was located on the second floor of building 2 and while it was a longer walk to the beach, the location provided a view of the pool and the sunrise. 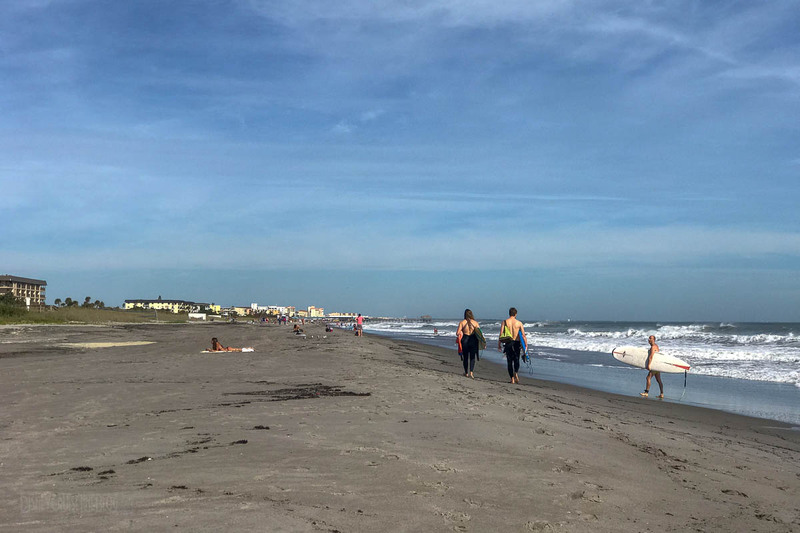 I’d leave it up to you to decide if you’d put in a request for a specific building depending on whether you wanted to be closer to the beach or not. 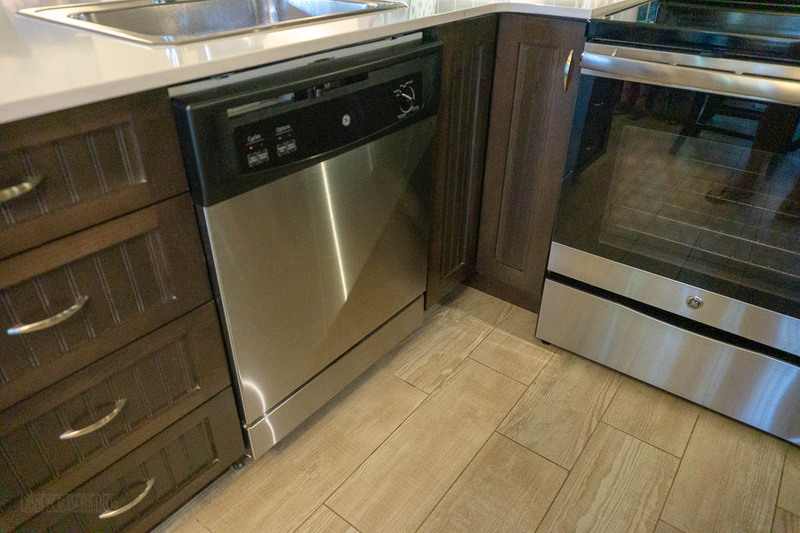 Look close, like the bottom of this picture, there are 2 gas grills available! 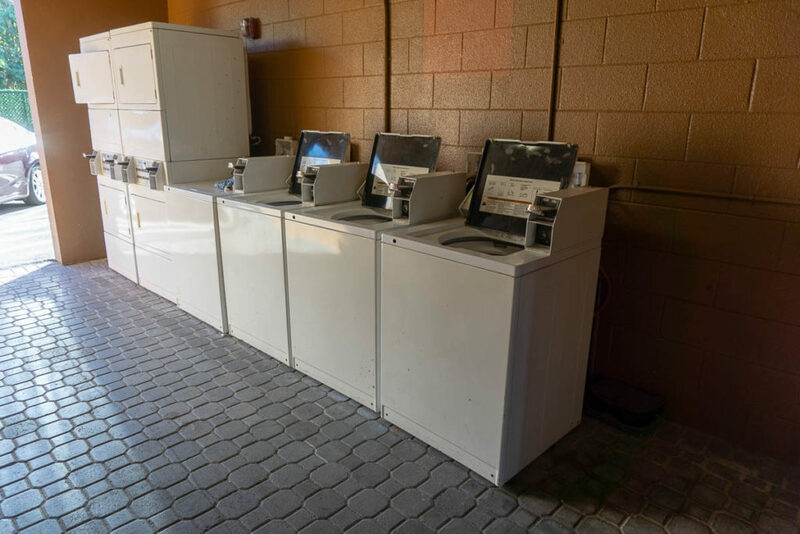 The resort does have washers and dryers available. The machines take quarters and the washers were $1.75/load. Sorry, but I did not notice if the dryers were any cheaper. Now for another last, but not least statement. The resort does have some decent wifi available in the rooms and with varying success around the pool. 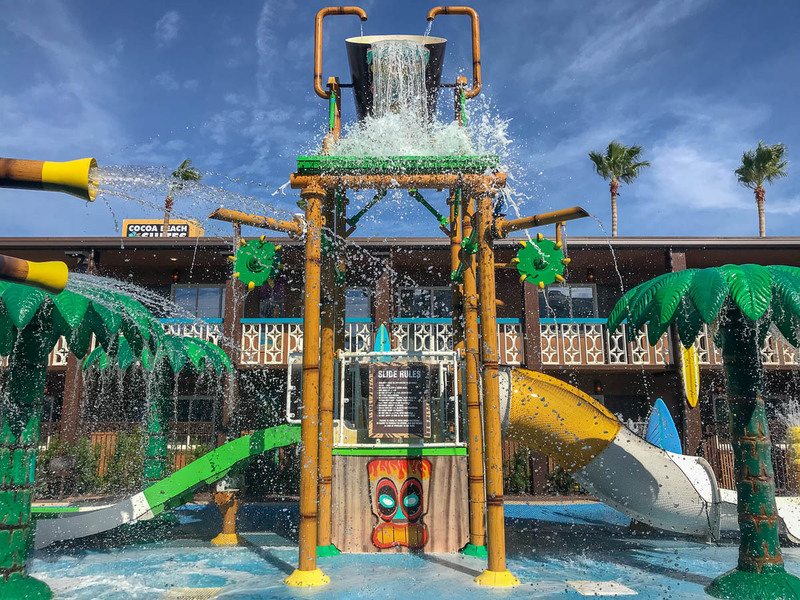 According to the resort’s website, there is a surcharge for wifi, but it was not a line item on our final bill – it was just available using our last name and room number on a login screen. 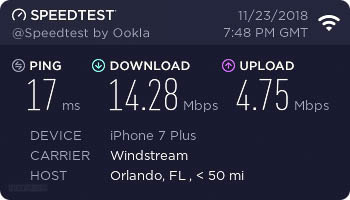 The in-room wifi was more than adequate for our usage which included streaming college football on an iPad. 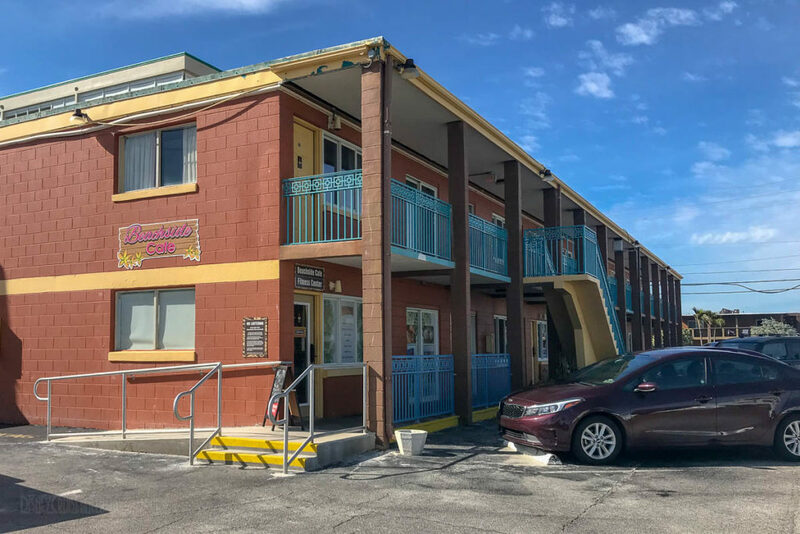 Westgate Cocoa Beach Resort does not offer any cruise parking options, primarily because there is limited parking available compared to other places in the immediate area that do offer cruise parking. 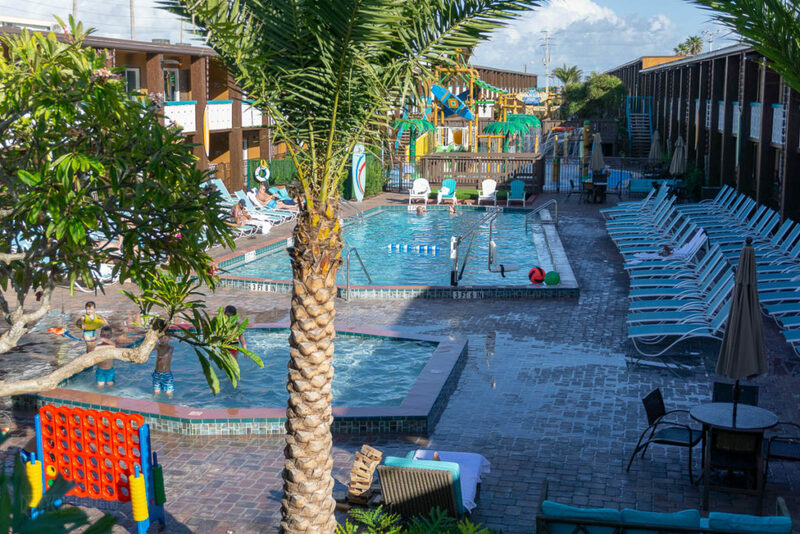 In fact, Westgate Cocoa Beach Resort provides 1 parking spot per room. This posed a bit of a problem, as we had 2 vehicles. At check-in, I did ask about additional parking for my parent’s car as I was willing to purchase a parking pass for a 2nd car, but this was not something they would do and they would not issue a second parking pass. They told us we could park the second area in a “visitors area” closer to the beach. I envision parking to be a bigger commodity during the peek season where the resort is at or near capacity, but I really just wanted to sleep knowing our cars would not be towed. I decided to give my parents the parking pass and write my car’s make/model and plate on the check-in paperwork in an attempt to show both vehicles belonged to resort guests. 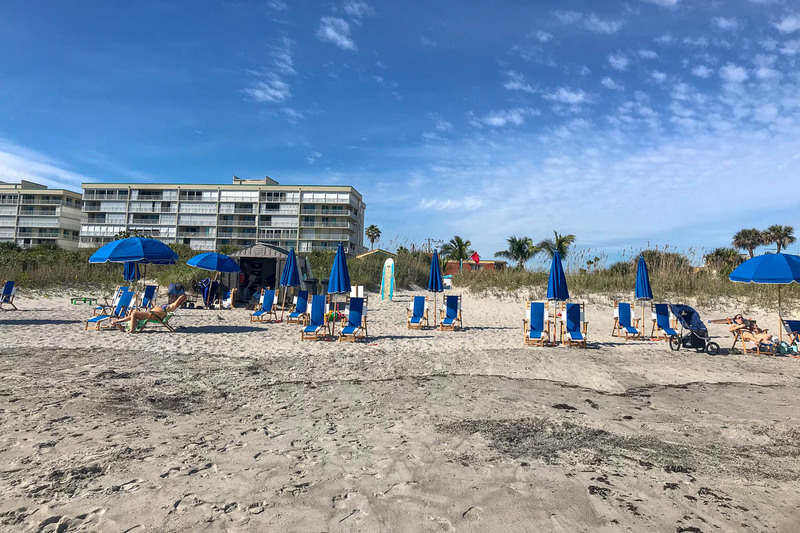 All in all, we (my parents included) enjoyed our stay at the Westgate Cocoa Beach Resort and it is absolutely an option for the next time we chose to stay in the Port Canaveral area. Now for the million dollar question, is this worth it for a brief pre-/post-crusie stay? 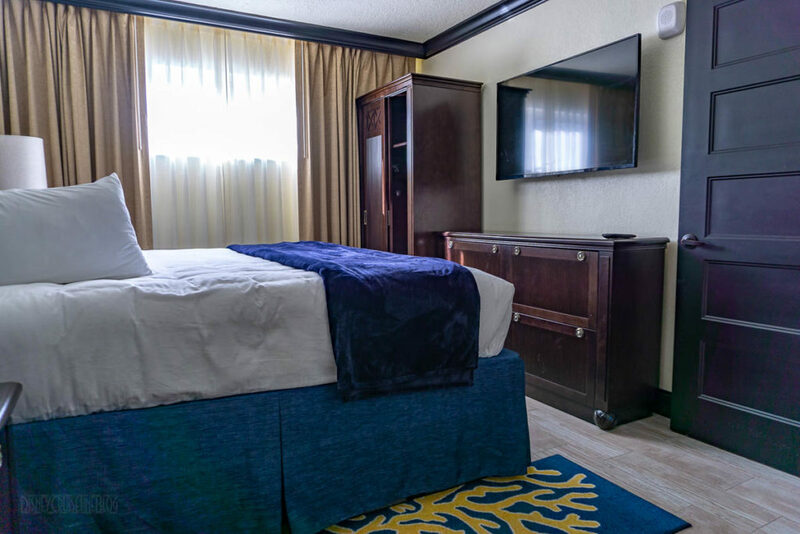 If you are simply interested in a place to stay the night before a cruise after a late arrival, I’d say stick to a basic hotel for the night. 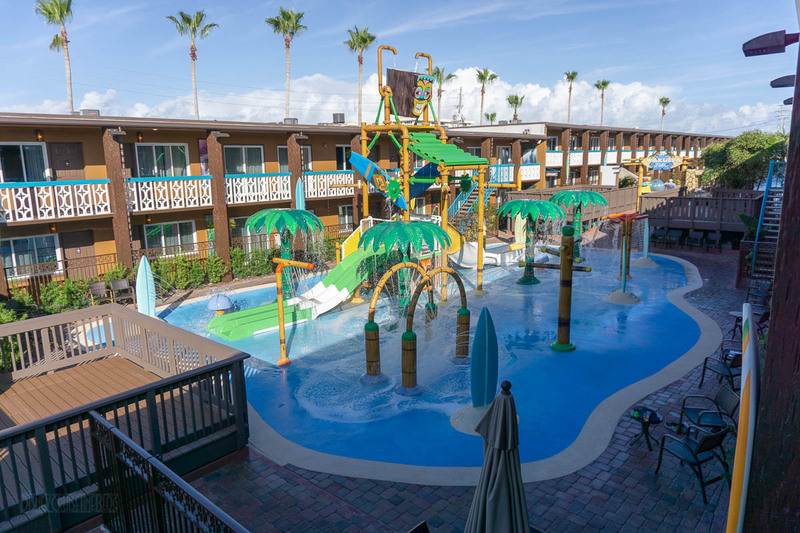 However, if your family enjoys the beach and pool and you have extra time before or after your cruise, Westgate Cocoa Beach Resort is absolutely a place to consider if you want to spend a few extra days in Florida outside of a theme park. Check-in is at 4PM and checkout 10 AM, we arrived before 4 and our room was ready, but as with all resort stays, I would not expect this to be the case each and every time. 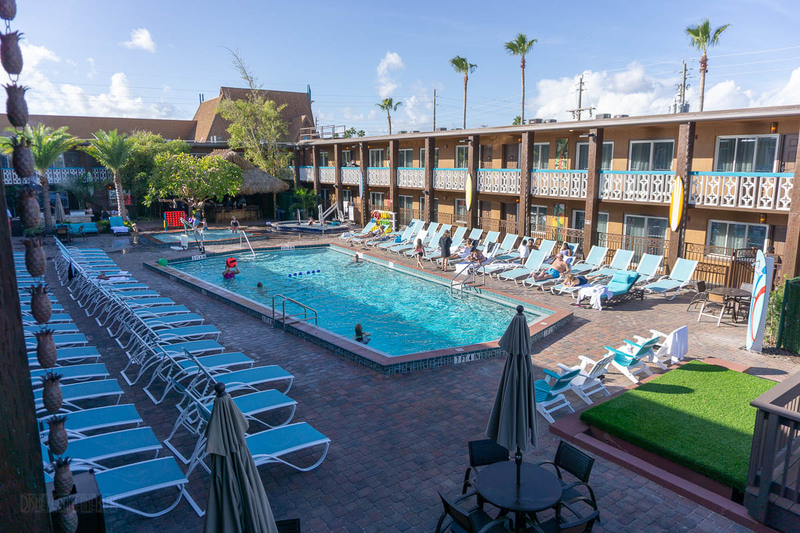 Westgate Cocoa Beach Resort is located at 3550 N Atlantic Ave, Cocoa Beach, FL 32931. You can find out more about the resort at their website. This entry was posted in Reviews and tagged Port Canaveral by Scott Sanders. Bookmark the permalink. 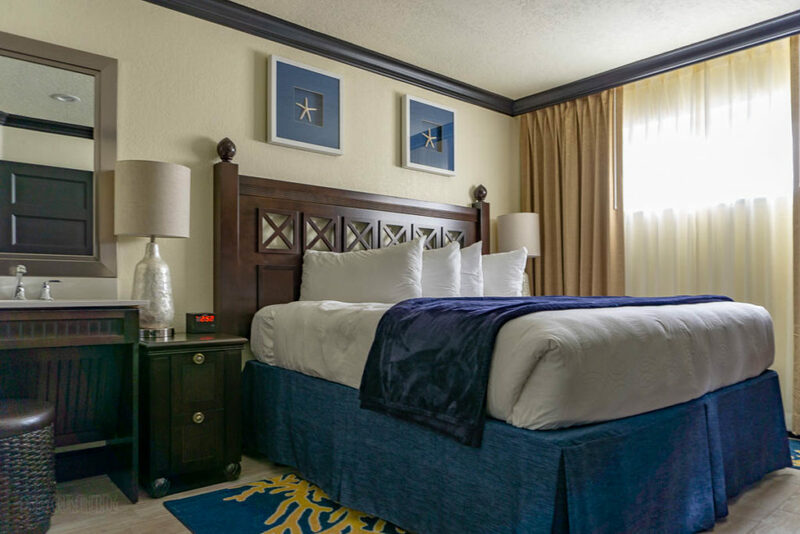 We have a room booked at the Westgate for our Fantasy cruise next month, so I am excited that you reviewed it. There’s limited information on this resort available now that it has been renovated. (I chose a non-refundable rate to save money, so happy to hear that you were satisfied with your stay). Were there any ongoing renovations at the time of your stay? Hi Jessica, we did not encounter ongoing renovations during our stay. 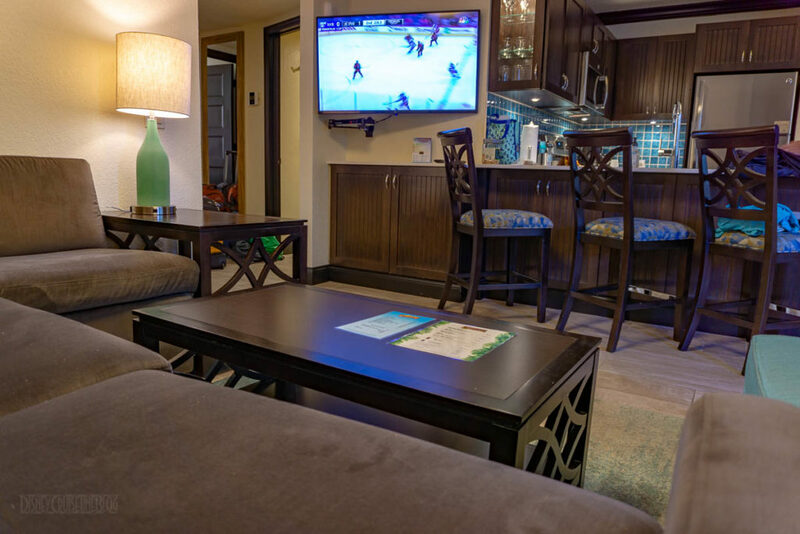 The resort appeared to be completely renovated. However, it was hard to tell for sure, but building 7 by the beach may have been getting worked on. I did notice a construction dumpster in the back lot with debris. Do you know if the shuttle service also takes guests to the Disney cruise terminal? Don, the shuttle is just for the pier. I did inquire about cruise parking and shuttles. This is not currently a service offered by the resort.